Okay, so it's a terrible pun, but someone's got to do it. 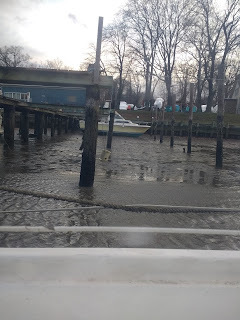 Last episode, I discussed some of the issues with inclement weather, but from our experiences this March, I thought I would do a bit more on the tidal issue. I meet a lot of folks who think that the tides only matter in the oceans and in oddball circumstances like the Bay of Fundy. They think that rivers and lakes, estuaries and bays are somehow immune. Let me assure you, they aren't. Take a look at the two pictures below. 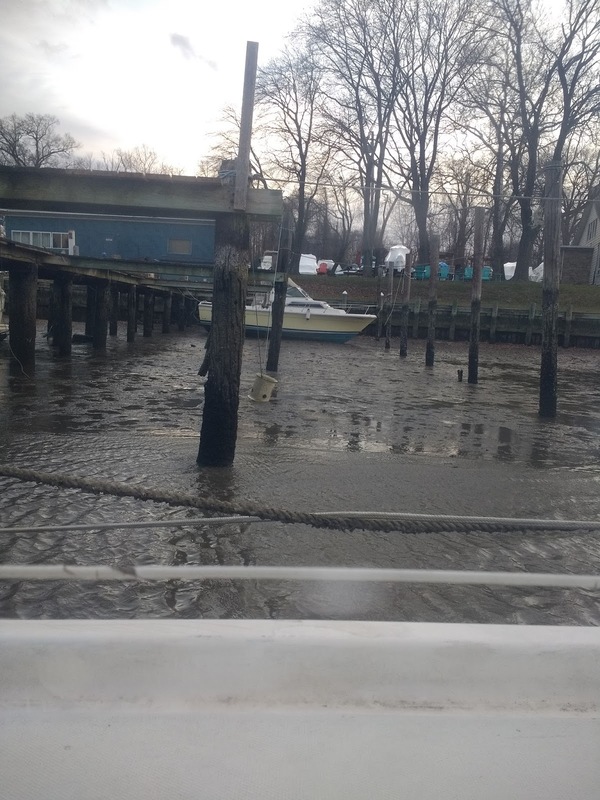 One is a rain-driven high tide at our marina on the Middle River. 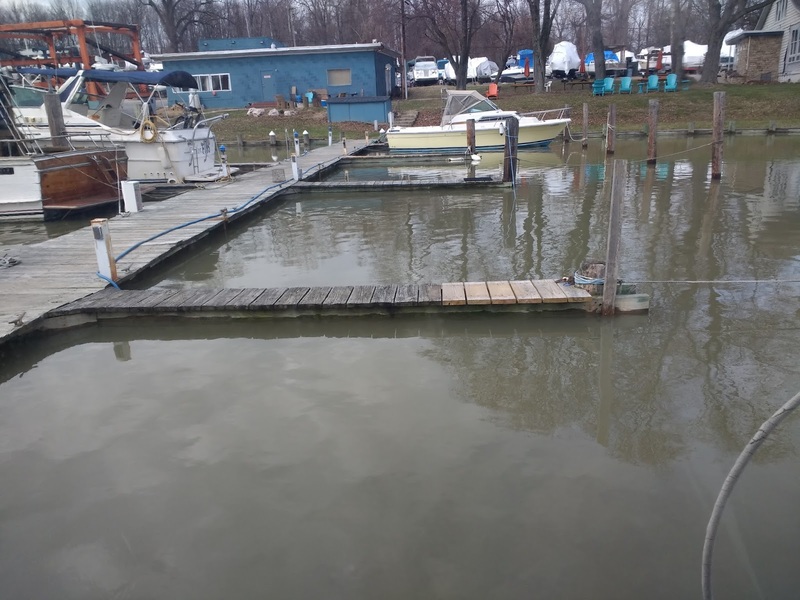 You may note that the water is within a few inches of swamping the fixed piers. We've seen worse. A few years ago, a November high tide sent the docks a full ten inches under water, which made getting to one's car a bit. . . um. . .more entertaining than usual. This is about as high as it gets without getting one's feet wet, though we've seen it 10" over the docks. 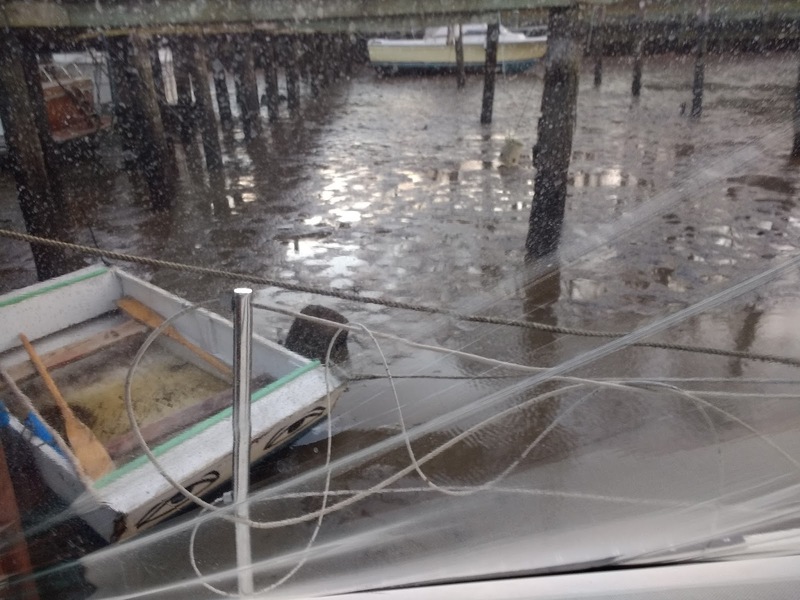 The second shot is from roughly the same vantage point in our wheelhouse, but this after two days of winds gusting from the NW at 60+ mph. What you are looking at is mud, and yes, the boat in the background is the same boat in the same slip. The disturbing part: This is HIGH tide. My point is, you're never immune to the effects of tidal and wind driven water, nor of coastal flooding from rains upstream, and if you're wise, you'll plan for it. But how? There are several tactics to deal with monster tides. The most common being the humble footstool, which is easy to keep on hand and has other uses....they also blow off the dock rather easily. If you'll look next to the dinghy in the low tide shot you'll see a sort of lump just behind it. That is the zebra-mussel encrusted stepstool we lost last year. Caveat. 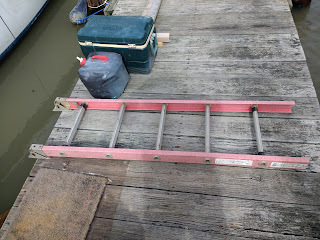 We also use a handy section cut from a discarded ladder to get both up onto dock and DOWN onto the dock. . . .depending. If you cruise, you'll find tide conditions different in every region in every port, from variances of inches to variances of tens of feet. Do your homework and you won't be stranded on the vessel begging people on the cell phone to come and throw you food. A stub ladder like this is easy to carry aboard, but can get you on and off the boat if the tides get ridiculous. This late winter has been one of multiple projects, most quite successful. Our enclosure of the wheelhouse with FlexOGlass continues to make for some lovely afternoons sitting in the sun, despite cool temperatures and wind. This month, we designed and added a urine separator to our simple composting toilet setup (for instructions, see here) which has made a HUGE difference in how often we must empty the waste (we're now getting ten days or so between having to dump the bin), so I recommend that highly. The weather has been hugely erratic of late, but spring is only around the corner. Slip mates are popping up like crocuses to look at their boats on the hard with longing. 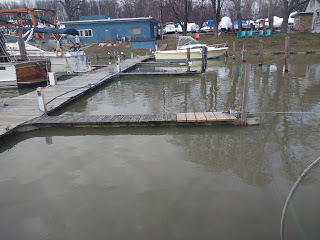 The marina is doing repairs and making ready for the boating season. We can't wait. What a calm sunset should resemble. So, with so many projects in the offing, I thought I should do a post to bring you guys current with a bunch of them. 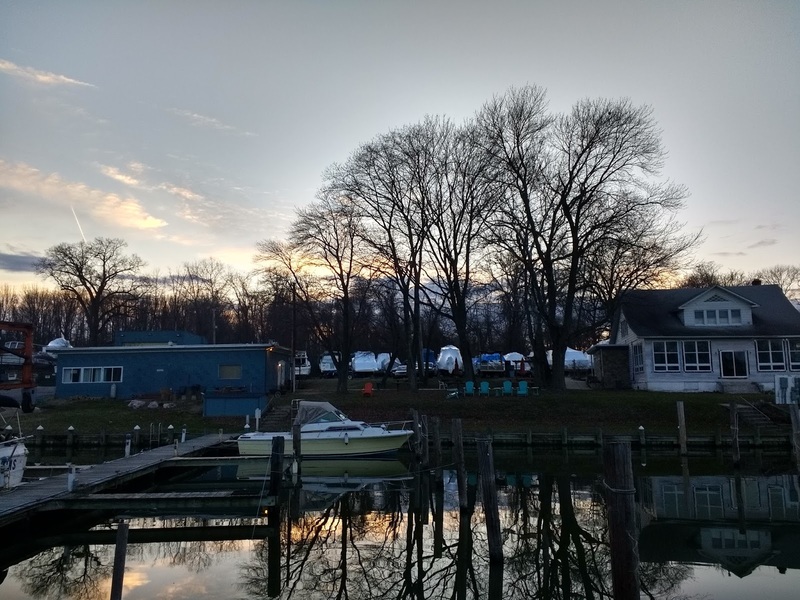 Here's a lovely evening shot at the marina. The last few days were NOT like this. 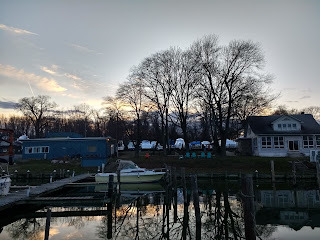 The winter storm that went through bombification and unloaded on us here in the east was one of the worst we've experienced here at the marina. Chief among the effects, aside from knocking the boat around quite a bit in the slip, was to blow virtually ALL of the water out of the upper Middle River and left us stranded in the middle of a mud flat, sitting some five feet below the dock and rather stuck on the boat. This not water. This is wet mud, and we're embedded in it. Fortunately, it only lasted a day. Now, I know half of you guys are asking yourselves, "with 65mph winds, how did the plastic glazing on their wheelhouse hold up?" See, I do pay attention. The answer is: amazingly well. We had no apparent damage of any kind to the FlexOGlass sheeting or our Gorilla Tape seams. It was noisy as all hell, but it seems to have held up just fine. The urine diverter we fabricated for the composting toilet was a real lifesaver during the storm. It kept us from having to get off and dump the toilet during some really nasty weather. At present, we're having to empty the 1.5 gallon pee bottle about every two days and the solid mass from the toilet itself about every 10, which beats the hell out of what we were having to do beforehand. In summary: if you're on the boat more than two days running a week, build one. Now the water has--mercifully--returned to the river and we can get off the boat without a ladder, the winds are fading, and life is returning to some semblance of normal. Looking forward to some calm days, some decent writing time, and the coming spring.